When basketball ultra-star LeBron James inked his new deal with the Los Angeles Lakers, it was more than just a big move for him and fans: it was a big move for the Los Angeles economy. That’s because a star such as James can create a significant financial imprint in any city he plays, according to a study co-authored by Harvard University Associate Professor Daniel Shoag and Stan Veuger of the American Enterprise Institute. It’s easy to see the difference that James’ presence can make when you take a look at the course of his career. He spent the first seven years in Cleveland, left for Miami for four years, and then returned to Cleveland in 2014, and there’s a definitive impact to the economy each time. Specifically, the effects were felt most strongly within one mile of the arena, but even within seven miles, a difference was still obvious. As a quick example, the study put together two charts showing the number of restaurants within a one-mile radius of the stadium in both Miami and Cleveland during his presence and without. 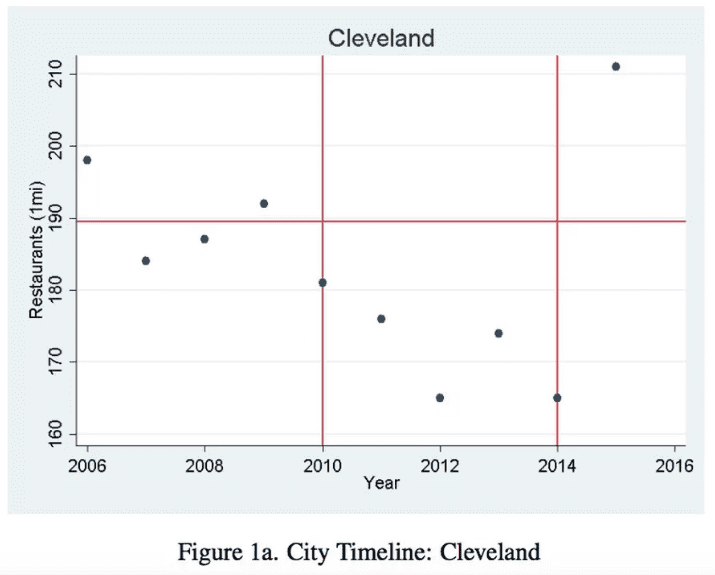 Note: The figure shows the number of restaurants within one mile of the Quicken Loans Arena in Cleveland for each year between 2006 and 2016. LeBron James left Cleveland Cavaliers in 2010 and rejoined in 2014. The horizontal line represents the average number of restaurants within one mile of the stadium before 2010. 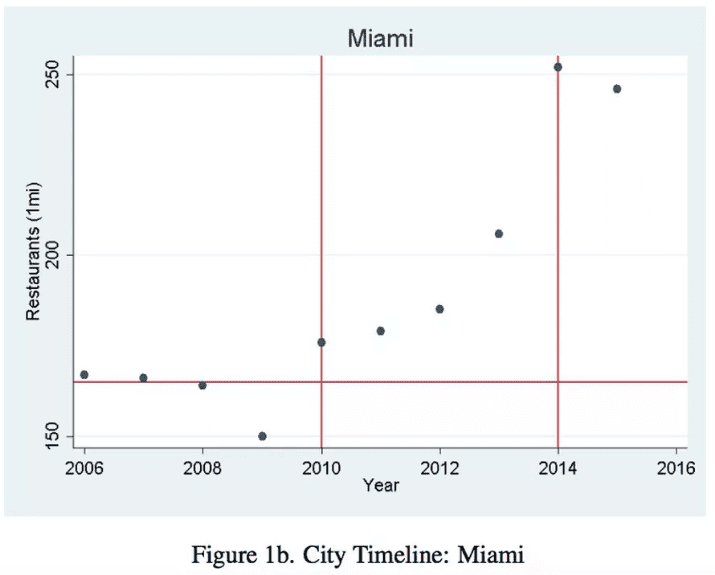 Note: The figure shows the number of restaurants within one mile of the American Airlines Arena in Miami for each year between 2006 and 2016. LeBron James joined Miami Heats in 2010 and left in 2014. The horizontal line represents the average number of restaurants within one mile of the stadium before 2010. So, based on all this information, what can Los Angeles expect from the James effect? 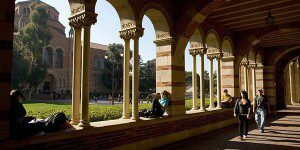 We talked to Jay Tucker, the executive director for the Center of Management of Enterprise Media, Entertainment, & Sports (MEMES) at the UCLA Anderson School of Management, to get his opinion. With more than 20 years of experience in the sector, Tucker was able to offer a detailed look at James and the Los Angeles economy. “Selfishly, I’m excited that he’s coming,” Tucker starts out. “LeBron James is a generational athlete. He’s also a champion of social causes and a shrewd businessman. His arrival will create many opportunities for Los Angeles.” Those opportunities range from easily quantifiable variables such as more local restaurants and bars to less easily definable improvements that could cover everything from better public transport to increased merchandising and new business interests. In general, Tucker sees Los Angeles as an excellent location for James because of the city itself and the team. LA, being more spread out and without a major city center, could gain even more restaurants, bars, and hangouts than other cities. Part of the reason is because Los Angelenos are already used to driving long distances to get to games at the Staples Center. At the same time, the Lakers have a solid brand identity that is tied very closely to the city. This will make it even easier for LeBron James to create an impact because Lakers’ fans are already ready and willing to show support for their team. The truth of the matter is that Lakers game attendance is already impressive without James, with James it will only grow. As for downstream effects that Tucker expects, they’re difficult to quantify but could cover a wide range. For example, studies have shown that successful sports teams improve city moral. Then there’s the fact that as more fans try to attend Lakers games from around the city, there will be a higher demand for public transportation, which could encourage updated infrastructure. However, Tucker does warn that Los Angeles can’t just sit back and rest on its laurels if the city wants to gain the full economic impact of James. Just as the city already offers packages for individuals looking to visit all the theme parks—Six Flags, Disneyland, Universal Studios, Sea World—the city should also look into creating Lakers’ game packages. This would be a great way to partner with different initiatives around LA and bring in outside visitors. Lastly, we asked Tucker what MBA students should take away from the James effect and his overall career. One of the first things he pointed out was James’ positive reputation. In addition, Tucker feels that students should pay attention to James’ ability to be multi-faceted. Not only is he deeply invested in his basketball career, but he also has business interests, social interests, and more. James does well on and off the court.